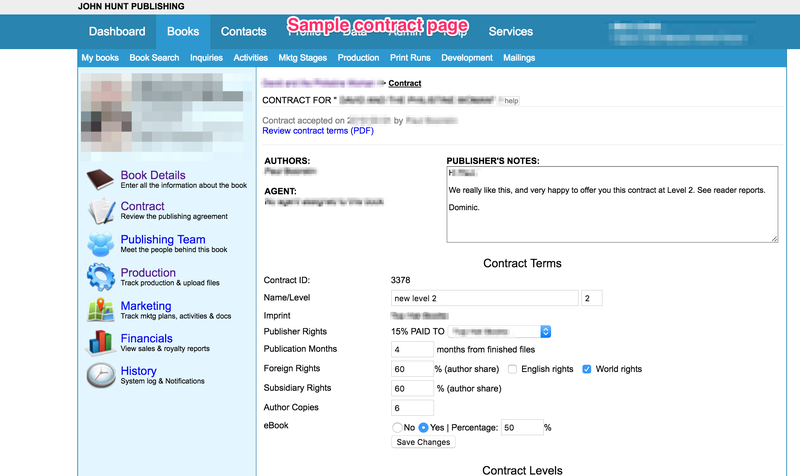 The publisher of the imprint offers a contract based on the Reader Reports. The offer is made through the database, with space for comments, and accepted or declined by clicking a box, with space for reply. From submission of the proposal, through a handful of reader reports, to the contract offer (or not), usually takes around two weeks. The full text of the contract is given in Appendix 1. We can not change the wording of this from one contract to another. If there is a point that would make sense to change across all of them, please raise that on the Author Forum and we will consider it. Every title is published in print and as an ebook. Ebooks are 50% royalty throughout, on receipts. Royalties on print are the same throughout the levels with the exception of level 1, where the top rate of 25% kicks in from the start. In both cases, royalties are based on "receipts" or "net receipts," i.e. the income we actually receive from the retailer or distributor. More on this below. There is a small deduction from ebook royalties to help towards production costs (see the section on ebooks in Chapter 8). This is $0.50/£0.30 or $1.40/£0.90 per page on the ebook (unless it's a really difficult one, in which case we'll get back to you separately). Subsidiary rights; 60% in author's favor. We do not ask for "non-book" rights like TV, film and audio book. Every manuscript is copyedited and proofread. Every title is marketed, and gets a certain amount of promotion that will be displayed on your book's Marketing page. Editing title, author and marketing details on the book pages, and distribute sales sheet and information to book databases worldwide. Presenting title to major trade accounts worldwide; offering title to trade-marketing programs such as ABA Advance Access, Dial-a-book, Ingram catalogue, The Bookseller Buyers Guide, IndieBound UK. More on sales in Chapter 16. Tailoring an initial publicity program to build author and title profile in the media online, in print and on air, and to retailers online and on the high street. More publicity for every 500 copies of the print or ebook that are sold. Sending out review copies on request from reviewers (unsolicited copies are rarely reviewed). In addition to the six free author print copies in contract (but freight is not free, see contract clauses below), there are up to 20 promotional print copies available to the publicity team. More print copies may be purchased at the author's discount. Digital review copies are unlimited. Newsletter to retailers and foreign publishers to encourage orders and rights deals. More on the process of sending them out in the section on Review Copies in Chapter 11. Publication schedule; nine full months between finished files and publication. We ignore the current month, so files finished in January will be scheduled for publication in November. More on this, and on marketing in general, in the Introduction to Chapter 9. To get a feel for how titles usually sell, in the industry as a whole, see the section on Estimated Sales in Chapter 4. Below are some specific points related to each contract level as they currently stand. We do change these over time, so for specific details of your own contract as at the date you signed it, check your Contract page. In all cases, it depends on the manuscript, and we tend not to offer a contract without that, as there is nothing for the readers to comment on. Printed books; 25%. Ebooks; 50%. Contract level 2: Likely sales in the thousands. Great text, right presentation. Author is more likely to be known nationally than internationally. Has or will get good endorsements from key figures. Author has a good “platform” and is active. Printed books; 10% on the first 1000 copies, 25% thereafter. Ebooks; 50%. Contract level 3: The author isn’t particularly “known.” Likely sales in the hundreds. Could do a lot better on the sales if it spreads by word of mouth, if pushed through activities, networking—but a buyer is unlikely to stock many, or any, initially. Author contribution; £350/$600 + £14/$22 per 1,000 words. Contract level 4: Good content, worthwhile publishing, could find its own niche, could do well, but it’s a long shot. Printed books; 10% on the first 1000 copies, 25% thereafter. Ebooks 50%. Author contribution; £500/$750 + £18/$28 per 1000 words. Contract level 5: Good content, worthwhile publishing, but the design/production is going to be expensive, whether it's many notes, or photos/diagrams, or poetry, etc. Or we believe it has potential, but needs more editorial work that we can give in a light edit. Or it is in a non-standard format, hardback, or color—in other words, it does not fit easily with our usual processes and costs, so we will need to get back to you separately on it. Printed books; 10% on the first 1000 copies, 25% thereafter. Ebooks; 50% (conversion cost deducted at the higher rate, more in the section on Ebooks in Chapter 8). On all books—every time another 500 copies is sold, we send you a note, and put more work into promotion. If you would like to try and speed this up, we offer extra marketing and publicity services for purchase. Check out the options in the section on Extra Publicity in Chapter 7. We edit every book, but sometimes authors want more help—longer reader reports, mentoring, writing advice, heavy editing, structural editing, rewriting, or just an index. If you want to consider any of these, go to the section on Extra Author Services in Chapter 7. For contracts with an author contribution, we send an invoice when you accept the contract, which should come through in a few days. Standard terms are payment in 30 days from invoice. If the final completed manuscript comes in at more than 20% above or below the original submission or estimated word count, we will send another invoice or supply a refund. There are no further costs. The reasoning behind contract levels: Quality and sales are not synonymous. So the levels relate, primarily, to marketability, and to the cost of publishing. Much of that depends on whether you have published before and what kind of "platform" you have (publishing jargon for whether anyone is going to buy your book because they've heard of you). It does not necessarily have anything to do with how good the book itself is. We enjoy publishing good books even when, on our reckoning, they may not cover our costs. How expensive it is going to be in the editorial/design stages is also relevant—how many bullet points, boxes or diagrams, how many pages. It does mean that the titles that do well for us are not subsidizing those that don't—they're on a higher royalty rate than they might get elsewhere. It does not mean that low-level titles can never break out—we edit and promote every book. Several titles that have done best for us, selling in tens of thousands, or even millions, would have been categorized as level 4, initially. But they are rare. If we were to promote each book with the optimism we feel for it, we would go broke in short order. Hence this rough breakdown. Affording it: If we offer you a contract with an author subsidy, and you cannot afford it, we're sorry about that; please don't take it, or stretch yourself financially. If you object to it on principle, well, we just have to differ. Either way, keep looking, or publish yourself. We cannot compete on royalty terms with self-publishing, because most of our sales are through the trade. The trade takes 50–60% of the retail price. Many of the books are returned, and pulped. We have high proportions of unsold stock, free review copies. In the first year we usually have to print two to three times more than we sell. Our costs are higher than yours, as an author, so on purely cost grounds you are better off self-publishing through Amazon (CreateSpace) or Smashwords. Author services: In the large majority of occasions most of these are voluntary options. But there may be instances where we say something like "this could sell, and you have a good "platform", but "writing" is not one of your strengths. You need help to get it up to publishable standard - at least more than can be provided for by our normal copyedit. We can only give you a level 2 if you chip in here. Or, alternatively, "we love the manuscript, but you have no "platform". We can only give you a level 2 if you buy into the Extra Publicity package. Fiction contracts: Fiction is particularly difficult. It's not as easy as with non-fiction to pin down the market of interested readers. For new fiction authors, word of mouth through the social networks is overwhelmingly the most effective way of getting sales. Without a prior record of success it is near-impossible to get placement in the stores, other perhaps than in stores local to the author. We bring fiction out, whatever the level, at the lower retail price (our standard pricing is given in Chapter 5). And, increasingly, most fiction is sold through ebooks, particularly in genres like crime, horror, romance, SF, where it can be up around 80%+. And we pay a 50% royalty on ebooks. And in ebooks, a key factor is price. With our low prices (and we also often price discount down to 0.99), and the 50% royalty, it does not leave us much to cover the costs of bringing it out (particularly after the discounts we still have to give the sellers, VAT in the UK etc. ), until it's selling in the thousands. So we are more likely to ask to share the cost on fiction than non-fiction, though that is not the same across all imprints (the Perfect Edge imprint for instance has no subsidy titles, but then it does not look at unsolicited submissions). Ebooks: We make a small, once-only charge on the cost of ebook conversion, deducting it from royalties. It will appear in the royalties section on your Financial page. See CHAPTER 8: EDITORIAL – EBOOK. Changing contract levels: Reader reports often say something along the lines of "this would be a better manuscript if xyz were done," but we do not look at the proposal again. For one thing, we pay for the reader reports, and do not want to do so a second time around. For another, part of the decision is based on your "recognition" factor. It may be a better book, and have more long-term potential for sales, but that does not make it any easier to get it into the trade to begin with. Where our income comes from: Author subsidies amount to around 5% of our income, and there's another couple of percentage points from selling books to authors (many of our authors actively sell books on tours, workshops, through their websites). Around 93% is from selling books to retail (physical stores and online). 18% of our book revenues go back to authors in royalty (increasing each year as the proportion of ebooks grows). We only publish titles that we believe are good, that are worth publishing, that could/should sell, and look at each one on its own merits. We work at selling every title, not just in the increasingly difficult task of getting books onto shop shelves but at finding an audience. Contrary to traditional publishing, we do not expect strong-selling titles to subsidize the majority that lose money. We think of ourselves more as a co-publisher with the author, where the author sees as much information on schedules, progress, sales, marketing, contacts, as the dozen or so people who will be working on his/her book, and can contribute to the marketing/PR if they wish. Alternatives: We are not the cheapest route possible, if we ask for a subsidy, but we are well down the price scale, and cannot do what we do for less. We cannot do it more quickly, either. It’s the time the job takes, and getting it to the market, circulating the information. Whoever you work with, do not expect royalties to recover the cost. But you can do it all yourself. Have a look, for instance, at; http://searchwarp.com/swa578084-Review-The-Fine-Print-Of-Self-Publishing.htm, or check out http://ereads.com/2011/01/do-authors-make-good-publishers.html, or http://blogcritics.org/books/article/self-publishing-70-of-nothing-is/, www.sfwa.org, www.vanitypublishing.info. Self-publishing, strictly speaking, is where you buy and own the ISBN, and do all the editorial/printing/marketing work yourself, or pay people separately to do it. It is not easy. Most independent authors work through one of the major subsidy houses. There are three big ones, each bringing out thousands of titles every month, so they have the most competitive prices—Lulu, CreateSpace (owned by Amazon) and Author Solutions (including Author House, Libris, iUniverse, Trafford and others; owned by Random Penguin up till 2016). Working/hiring freelancers by yourself, $15,000–$30,000 is generally reckoned as the "sweet spot." The most up to date (as of April 2016) information on the costs of editorial and design (editorial assessment, copy editing, proof reading, interior layout and cover) comes at Reedsy in How much does it cost to self-publish a book?. Those elements average out to $3,000+. That is before print, and the costs of surplus printed copies for reviews, to take into account returns from the trade, distribution of information, sales, marketing, publicity etc. Timescale on a contract offer: We usually get back to you within a week, three weeks at the outside. This (relatively) quick response doesn’t mean there’s a hidden catch, that we are trying to rush you into an ill-considered decision, or making a pre-emptive grab for a book that could be wildly successful. It’s just the way we prefer to work.